Communicating with your users online often comes in the form of one-way communication. This makes it hard for you to gain insight into what users actually think about your website. This is where website feedback comes in handy. By creating an opportunity for user feedback directly on your website, you have the possibility to create a closer relationship with your users and thereby minimize the risk of a bad user experience and the prospect of users swapping to other more costly channels of communication. User feedback is extremely valuable as it makes it easy for you to convert actual user experience into online improvements. "I'm looking for a phone number I can call for questions relating to issuing a new passport, but I can't find it on the page!" "I'm experiencing problems downloading the forms on this site on a Mac." "I've spent a lot of time looking for opening hours during Easter, but couldn't find them." If your users feel you listen there's a great chance that they will change their role from simple users to web ambassadors telling others about their successful experience and maybe even give feedback on other issues on you website. You can probably find your way around your website in your sleep, but this often makes you blind to navigating your website from an outside perspective. So why not ask your users if they find what they are looking for on the website? This way you get an extra set of eyes for improving your website. When implementing a user feedback tool on your website, integrate it with your web analysis service. Think of the extra dimension you could add to your web analysis data by being able to filter user ratings and comments on your most visited and/or important pages! When opening up a new channel you must be prepared to take action and implement the constructive criticism and new ideas on your website. Otherwise, users won't feel that their feedback is taken seriously. Users tend to take their time to give feedback when they are either very happy or dissatisfied with your website. When giving feedback, users are normally anonymous which means that comments are unfiltered. Therefore I would recommend identifying a group of web administrators who act as a filter and only pass on the constructive comments to the rest of the web team and editors. 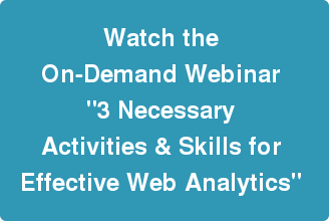 Watch the on-demand webinar "3 Necessary Activities & Skills for Effective Web Analytics".